Why Buy Used Auto Parts from Deercreek Auto Parts? 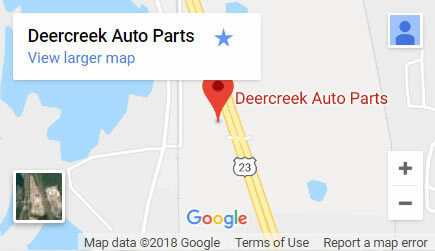 Deercreek Auto Parts has been in business since the 1950's and offer quality used auto parts that are competitively priced and up to OEM standards. Is the quality as good as aftermarket parts? The quality is better than aftermarket parts as these used parts came from the cars made in the factories to the strictest guidelines. Not that aftermarket parts are bad, they are just not as good quality as the original manufacturers parts. We also document all of our parts on our computer system which shows the original VIN from the car that was dismantled. Our used auto parts come from cars that we either bought from insurance auctions, car dealerships or members of the public that wish to sell their vehicles to us. We only purchase quality late model vehicles. Yes we can locate parts that we don't currently have in stock. As a company, our customers come first and if we can make life a little easier for them, then they will return happy. We are able to search our parts database for just about any part that other salvage yards inventory in their systems. Do you sell Engines and Transmissions? Yes we do sell both engines and transmissions. All parts come with a 90 day warranty and are tested to make sure that they work before we inventory them. You can pay with cash, check, Visa, Mastercard or Discover. Yes we do deliver. We deliver to local businesses using our own delivery trucks. We can deliver out of our area using UPS and freight Carriers to either residential or business addresses. We do have a 90 day warranty from the date you receive the part. The part must be in the same condition as when it left Deercreek Auto Parts Depot. The warranty covers defective parts. If you order the wrong part and want to return, then we charge a 20% re-stocking fee. If the part is defective, we will either replace the part or give you a full refund less shipping. If the part was sold "AS IS" then we can not refund your money. Let your salesperson know immediately that you have a problem. Repairables are vehicles that usually have salvage titles and need to be fixed. Once fixed you can then arrange an appointment with your local Highway Patrol office to have it signed off as a rebuilt salvage vehicle. For more information, please call or email to get more details. What is left and what is right side? The left side is the drivers side and the right side the passenger side. The way to do this is stand at the back of the vehicle and face forward, then you'll never be wrong!